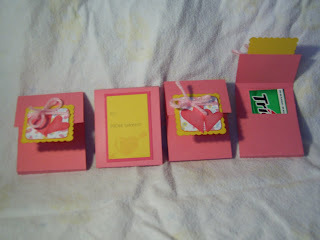 Inky Dream: Valentine's Class Treats. 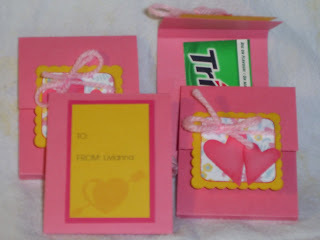 for having a Matching Set theme as I was in the process of making these gum pouches for my daughter's school! As usual, your DT work is beautiful! The inspiration for this project comes from a FANTASTIC blog! Be sure to have a look around her blog, it's crammed full of ideas and wonderful creations! Now I can only hope my daughter's teacher will allow these little goodies into her class! You would think Valentine's Treats would be welcomed, but her school is an odd sort! Great gum pouches! Fab matching set! Thanks for joining us at Cupcake and for your lovely comment! Farrah, They turned out super cute. Thanks for linking my blog. Have a great weekend and happy stamping! Gorgeous work, perfect for this week's challenge. Thanks for joining us at CCC. ooooo these are great! uh no wonder t.v time is sparse! Hey if LD can't give them out all trade them with your hubby for....you guessed it....CHOCOLATE BARS!! These are great! Bet your daughter was pretty popular on Valentine's Day!